Stampin' Up! Demonstrator Kim Price - Handmade by Kim: Timeless & Elegant Wedding Card - showcased on Kylie's International Blog Highlight & Giveaway! 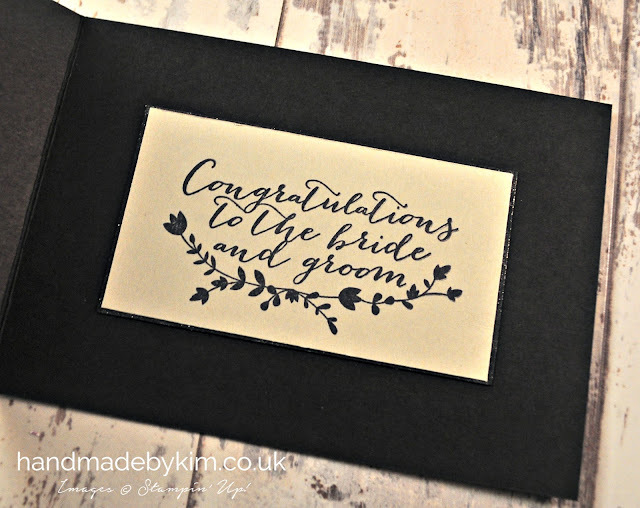 Timeless & Elegant Wedding Card - showcased on Kylie's International Blog Highlight & Giveaway! If you are visiting for the first time, welcome to my blog! Thank you so much for taking the time to have a look at the project I have made. 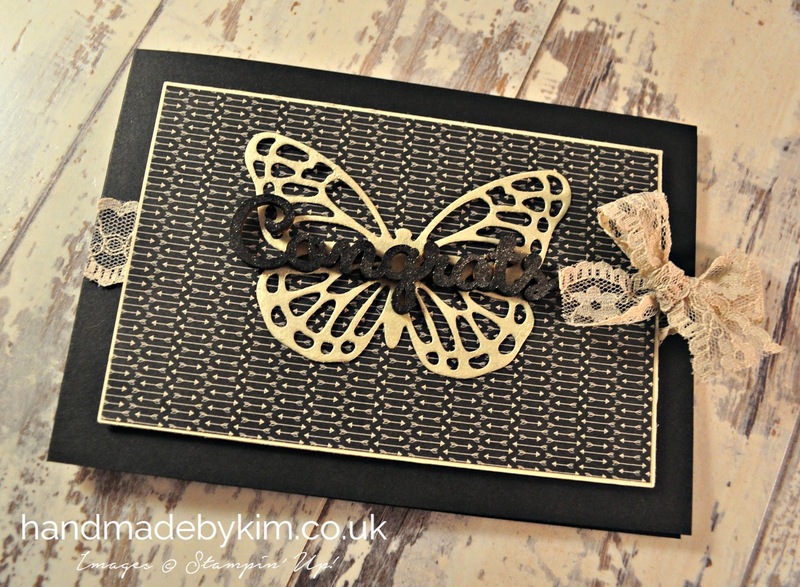 Today I am super excited to be taking part again in Kylie Bertucci's International Blog Highlight showcasing handmade cards made using Stampin' Up! products by demonstrators and customers from all over the world. Kylie has challenged us to come up with a card made based on the theme "Love" so I chose to make this beautiful wedding card. If you like my card please vote for me by clicking here. Once you have clicked on the link, all you need to do to cast your vote is click on the heart in the top right corner of the photo - my card is featured under photo number 11. The competition runs for 6 days so if you are planning on voting, please place your vote by Wednesday! I love the wooden sentiment on the front of this card. In fact I have used this technique on the team swaps I am making for Onstage Local next week. Its really glittery but unfortunately my photograph does not capture this. I still wanted to tell you how I decorated the sentiment in case you wanted to give this a try. I sponged black ink over the sentiment and then added a layer of glitter using the clear Wink of Stella pen. Simple! I also used the Wink of Stella pen on the inside of the card on the layer of black underneath the sentiment. You can just about see it sparkle in this photo. In addition to entering this competition, I will be giving this card away after the voting has ended. To be in for a chance to win this card, all you need to do is leave a comment on this blog. I will send this card anywhere in the world as I will be picking the winner at random. Good luck! You can buy all of the supplies I have used to make this card from Stampin' Up! To visit my shop please select Shop Online at the very top of this page. Lovely card. Great layout and love how the ribbon and bow and a touch of elegance. Thanks Sarah. Your comment was selected using a random number generator. I've emailed you asking for your postal address as you will be receiving this card! Love the colors you've used for this card! Such a timelessly elegant combination. Thanks Melissa! I am going to miss this paper but ready for new challenges and using different colours!